If I'm correct there are no airsoft shotguns that act like the real thing. That is, fire multiple bb's per shot. I know there are the cheap DE ones that have 3 barrels and 3 springs but thats a bit naff.Now this seamed a tad weird to me because surely bb's and shotgun pellets are closer related than bb's an bullets and yet here we are without a 'true' airsoft shotgun. 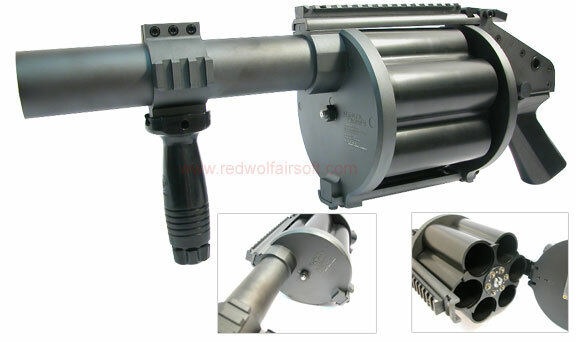 My idea would be to more or less use small grenade launcher shells in a shotgun. 4 bb's per barrel, 8 or so barrels and there you have it. A shotgun that fires 32 bb's per shot. Unworkable, otherwise it would've been done. In proper shotguns the BBs used are immensely small in comparison to BBs, buckshot only consists of about 8 "bb" sized shots, with a whole lot of smaller shot thrown in to still add effect to the scatter. If you were put 32 BBs into the barrel of an airsoft gun, they'd fill more than half the barrel, even if it was the same bore as a real shotgun. On top of that, as you said above, you'd have to use a phenomenal amount of gas to fire that many BBs in one go at any reasonable velocity and that would make the fps very inconsistent and consequently, extremely dangerous. Someone could probably put a pebble down their barrel and use all the gas to just fire that, it'd be like having a miniature, man portable cannon of death. There'd also be no way of retaining the BBs in the barrel without putting a lid on it, which would be impractical. And you can get 3 pellet buckshot so its pretty realistic. Meh, until AI releases their impact version, all 40mm shell are essentially "shotguns" rather than "grenade launchers".. Both tanaka and maruzen fire multiple rounds from a single shell and eject the spent shell to the side. The 'basket' is actually called a shell catcher/brass catcher - but these have their own problems, They fill up after 15 rounds and start to jam the shotgun to unusable levels after about 5/6. G&P Make M870's they work of an internal magazine tube and no shells, but do give a scattergun effect IIRC. TM/DE/ASG, doesn't matter, the DE and ASG have a nicer finish on them, but all 3 function the same really. as there isn't a gearbox that needs shimming and fine tuning the TM/Double Eagle comparisons on AEG's don't ring true. If you want a shotgun for airsofting, get one of the tri-shots. If you LOVE shotguns and want to use them occasionally, invest in either a Tanaka + nice shells or Maruzen + £100 of upgrades. and remember guys, This is all my personal experience coming to use here you don't work in an airsoft shop for 18 months and not pick up many variants on the same thing. I cannot for the life of me find a single 870 anywhere you lucky SOB! I was really impressed with the tri-shot I test fired. Dunno what make it was mind, it was a quick lend at The Stan. The range is impressive and I loved the way the BB's spread out in flight. craig - I spent since march trying to find the version I wanted. I noticed one on Airsoft Eire back in early october and put a deposit down straight away. still got to get it upgraded to be useful though.